It’s kind of mind boggling but a major media employer is asking people it didn’t hire to fill out a survey about the personnel process. Sure, you’re not a right fit for the job opening but we want to pick your brain for free. Jim Romenesko is the author of a popular blog covering media and journalism called JimRomenesko.com. Via his blog, he received this message: “I’ve never received a request to participate in a survey for a potential employer before. I didn’t get far in the process in a job I applied for at NBCUniversal, but I thought it was an interesting concept. The letter from NBCUniversal says, in part, “We are inviting you to influence us. We want feedback from anyone who applied for a job with us – no matter how far you went in the process. Your participation in this brief 10-20 minute online survey will help us to provide a better candidate experience to future job seekers.” That audible gulp you heard was someone aghast at the thought of taking a 20-minute survey for a company that didn’t hire them. NBCUniversal used a company called The Talent Board to conduct the survey, according to Romenesko. It is a “non-profit organization focused on the elevation and promotion of a positive candidate experience,” according to its website. Annually it hands out an honor called the North American Candidate Experience (CandE) Awards. The philosophy of the CandE Awards, according to The Talent Board, “is to recognize all corporations that meet the standard of candidate experience excellence.” For 2013, 122 companies applied to the award, and responses were collected from more than 46,000 candidate surveys, the company said. It appears the awkward “post-interview where the company doesn’t hire you” survey is related to the CandE awards. Romenesko.com reported that The Talent Board conducted the surveys. 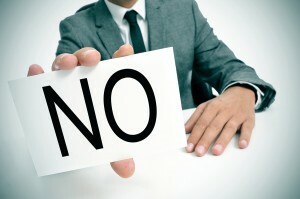 Molly Moseley, writing at The Linkup Blog, said there is value to companies providing feedback to rejected applicants. (Maybe this survey is one of way of maintaining communications.) She said forward thinking companies are providing feedback and it pays off. Good candidates will continue applying – Communicating with … good candidates shows you value the time they dedicated during the interview process. – The goodwill created by providing constructive feedback helps create a positive brand reputation.